Fennel is one of my favorite vegetables. Very aromatic, similar to licorice and anise. I love it tossed with olive oil and balsamic vinegar and roasted, or in this carrot-fennel soup. I got the idea for this gratin while browsing tastespotting and saw this potato-fennel gratin with Gruyere. It jumped out at me because I’ve had this chunk of Gruyere that I’ve been using in everything lately. 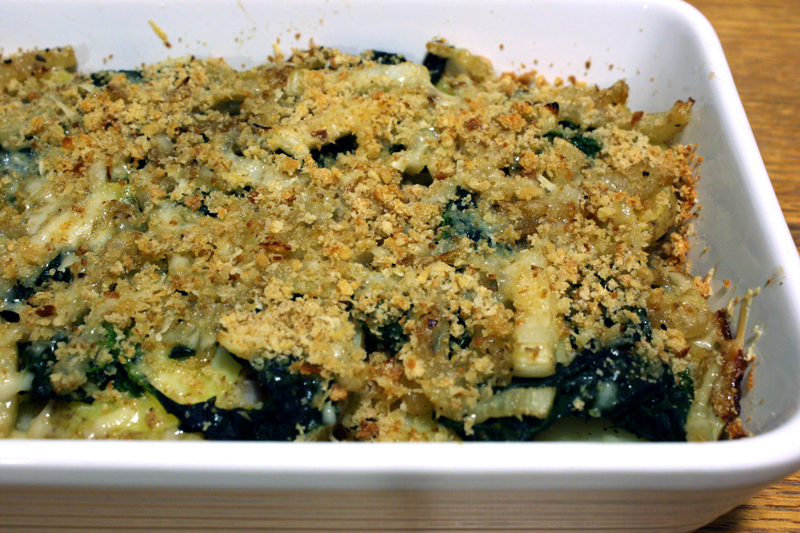 Instead of a cream-laden gratin I wanted to make one similar to the potato-kale gratin I made a couple months back – basically layering some vegetables with bread crumbs and a little shredded cheese then throwing it in the oven for a while. I made this in my smallest casserole dish which is about 5-1/2″ x 9″. Not a standard size, I know, but this kind of recipe is adaptable for any size pan. The amounts don’t have to be exact, in fact, I don’t think I measured anything. It’s my favorite kind of recipe. Leftovers are good for breakfast or lunch the next day with a fried egg. Boil potato slices in salted water for about 2-3 minutes, until tender, but not cooked through. Drain into a colander and rinse with cool water. Set aside. Saute the fennel and onion in olive oil on medium-low heat for 15 minutes, until tender. Season with salt and pepper. Remove to a bowl and set aside. Rinse the spinach and shake off excess water. Add the spinach to the pan, cover, and cook, stirring occasionally, until the spinach is wilted. Cool slightly and roughly chop. Season with salt and pepper. Drizzle a tiny bit of olive oil in the bottom of a small baking dish and spread it around. Arrange half of the potato slices to cover the bottom. Season lightly with salt and pepper and top with half of the spinach, then half of the fennel-onion mixture. Sprinkle evenly with the cheeses, then with breadcrumbs. Repeat the layers with the remaining ingredients. Cover with foil and bake for 30 minutes. Remove foil and bake another 15 minutes, until top is crispy.